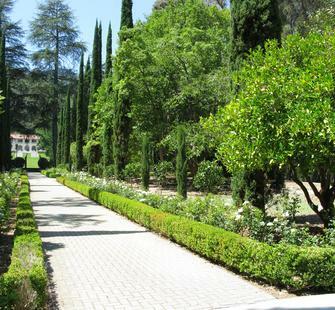 The historic Italianate Garden at Montalvo is situated across from the Villa and its sprawling Great Lawn. A testimony to the legacy of Senator James Duval Phelan, it is a work of art in its own right. For nearly 100 years, various organizations—including the Garden Conservancy and The California Garden and Landscape History Society—have hailed the Italianate Garden as an important historic site worthy of preservation. Senator Phelan was an admirer of Italian art and culture, which informed his decision to create this garden at Montalvo in the 1920s. When he traveled to Italy in 1922, Phelan sent photographs and plans of gardens he visited to his head gardener, George Doeltz, to use as inspiration for the design of the space. Doeltz drew from these as well as input from John McLaren, Superintendent of Golden Gate Park in San Francisco, as he worked. The final planting of the garden, featuring a strong central axis lined by cypresses and numerous citrus trees, takes inspiration from European tradition and celebrates California’s warm climate. While in Italy, Phelan also purchased sculptures to be incorporated into the Italianate Garden. One fine example of these, a marble statue of Adam and Eve entitled Ante Peccatum (or “Before the Fall”), remains in the garden to this day. The community has long rallied around Montalvo to support and preserve it. In this spirit, a committed group of Montalvo trustees, community members, and volunteers joined forces to rehabilitate the Italianate Garden in 2008. Forming a Garden Committee to lead their efforts, they launched a long rehabilitative effort to bring the garden back to its original splendor and preserve it as a destination for garden enthusiasts and area of peaceful natural beauty, providing respite from the hectic pace of Silicon Valley. The Italianate Garden underwent a major rehabilitation in the past decade, and Montalvo has these sponsors, donors, and volunteers to thank for their tireless efforts to help maintain our beautiful landscape.